There are several sizes, styles, and types of trophies and awards to fit any budget. From small, inexpensive plaques to large crystal trophies to the least expensive engraved dog tags, bag tags, and medals, our trophy division carries it all. If you are in need of awards or trophies for your upcoming event, check out these options available from The Trophy Studio in Los Angeles. 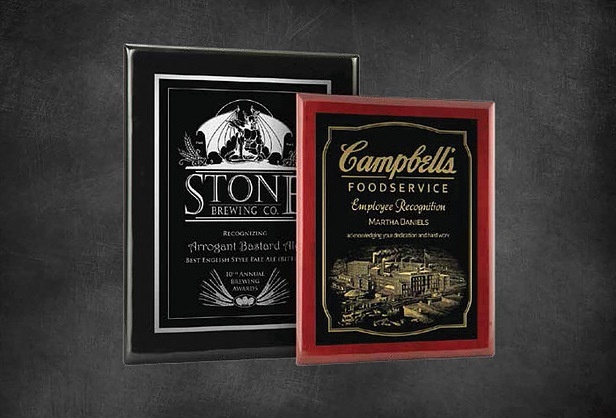 Plaques – Plaques are an excellent choice for showing recognition whether you hand them out as awards or install them throughout your venue. Your park, nonprofit, or museum can show appreciation for sponsors and donors by installing plaques. 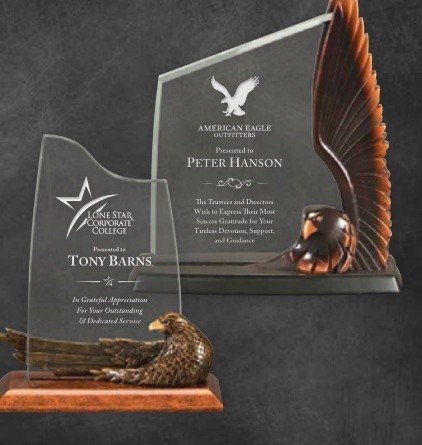 Acrylic – Acrylic is incredibly versatile, which allows us to make some amazing trophies. Plus, these awards are typically more affordable than their glass and crystal counterparts. Yet, they are still visually indistinguishable from these other alternatives. Awards – Our awards come in an array of sizes and shapes. Most of them have a high gloss black or rosewood monument base with an elegant metal statuette mounted on top, but we also have a wide selection of other styles. 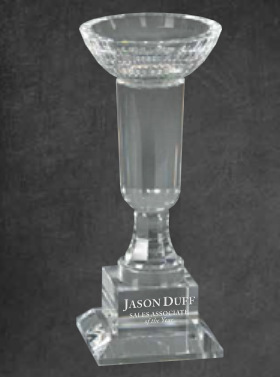 Glass – Our glass trophies come in numerous shapes, including star, flame, sail, diamond, column, and many more. There are also several sizes from small 5” by 3” pieces to ones that are 15” by 7” and beyond. Clocks – Earning an award that you can show off is great and all, but eventually as years go by, recipients will be tempted to use their desk or wall space for other purposes. However, when the award is functional, it will be useful for many years to come. This is why we offer clock trophies made of rosewood or crystal. Crystal – When only the best will do, you have to go with crystal. We deliver each of our crystal awards in a sophisticated lined presentation box. 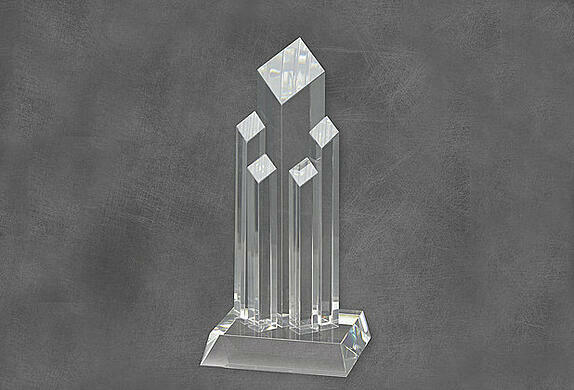 One of the most requested crystal trophies is the Eclipse. It comes in three different sizes and colors: blue, black, and amber. 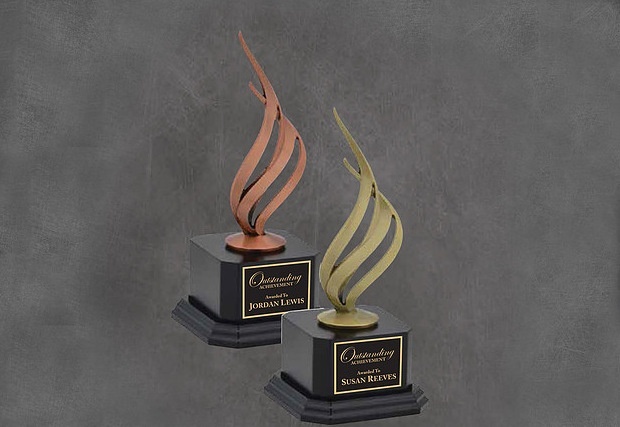 If there is a custom award, trophy, or other signage type that you need, the full-time staff at The Trophy Studio can design, manufacture, and complete it for you. For a nominal charge, we will engrave all of the above trophy styles. In fact, our state of the art laser engraving techniques and equipment can engrave just about anything, including wine boxes, flag cases, flasks, and much more. At The Trophy Studio, we do not believe in one size fits all solutions. We let our customers’ needs guide our products, craftsmanship, quality, and service. This has earned us a large clientele that includes professionals, government offices, associations, educational institutions, businesses, and more. If you are in need of the best trophies in Los Angeles, contact our trophy division today for a free consultation. If you are a regular reader of our blog posts, you know that our award and trophy lines of business have exploded in recent months. This is due in no small part to the addition of a state of the art laser engraver to our shop. Our creative team has been able to do some amazing things when utilizing this new tool. Consequently, we have become the best award and trophy business for Los Angeles, Glendale, and Burbank, CA. This part of our business has gotten so big that we have turned it into its own division: The Trophy Studio. What Does The Trophy Studio Offer? 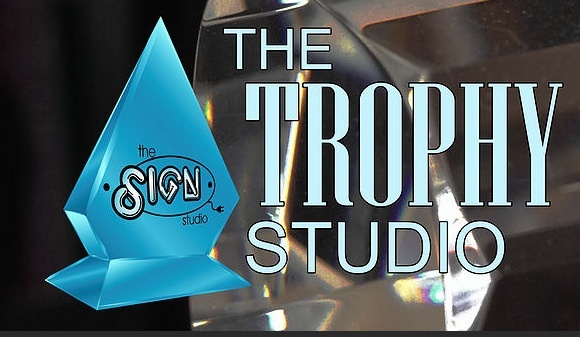 The Trophy Studio has a full-time staff that specializes in the design, fabrication, and completion of custom trophies, awards, and other types of signs. We pride ourselves on having a fast turnaround time. We understand that as you prepare for big events, ordering trophies and awards can sometimes fall to the bottom of your list and become a last-minute need. That’s why most of our trophies are available for pick-up or to ship out the next day. The Trophy Studio does not believe in cookie-cutter solutions. We base our craftsmanship, service, products, and quality on each of our client’s needs. We have a massive customer base that includes government offices, businesses, educational institutions, professionals, associations, and more. Awards – Our awards take a variety of shapes and sizes. Most of them feature a metal statuette and rosewood or high gloss black monument base. However, we have a broad range of variations on this theme. Crystal – Crystal is the smart solution when only the best will do. All of our crystal awards come in a fancy lined presentation box. The Eclipse award is a favorite. It comes in amber, blue, and black as well as three different sizes. Acrylic – We are able to do some amazing things with acrylic, and these trophies are generally less expensive than their crystal or glass counterparts while being visually indistinguishable. Clocks – The only thing better than earning an award is getting one that is functional. 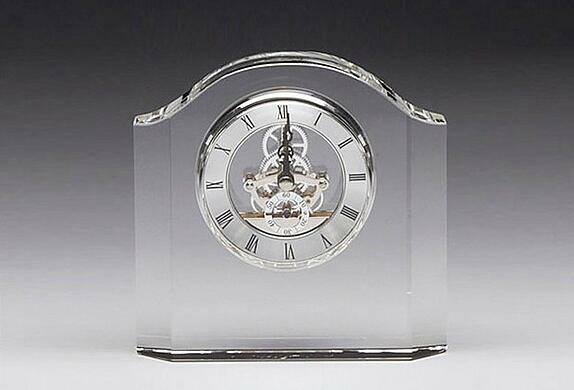 Our series of clock trophies are made of crystal or rosewood. Each piece has plenty of room for engraving. Plaques – Both indoors and out, plaques are an excellent way to show recognition. Museums, parks, and nonprofits often use plaques to show appreciation for donors and sponsors. Glass – Glass trophies are available in a wide selection of shapes and sizes. All of these trophies can include our custom engraving. We have cutting-edge laser engraving equipment and techniques for just about anything. We can even engrave flasks, wine boxes, flag cases, and more. You can even browse our trophy and award catalog online! From our headquarters in Burbank, California, you can find the best awards and trophies for Los Angeles, Glendale, and Burbank at The Sign Studio. Contact us today for a free consultation and estimate if you are in need of the best awards and trophies. Skilled artists can do amazing things with glass. The Blue Water Glass Art Award is no exception. It is designed to look like a big, blue drop of water mounted on a glass base. They come in three sizes: 8” x 3.5”, 10.5” x 4”, and 11.5” by 5”. This is the perfect award for enterprises or individuals who have made significant contributions to improving our environment. Venice Bowls made of crystal are the ideal way to show appreciation. These pieces are made entirely of real, clear crystal. The design features a bowl on a pedestal mounted to a base. All of our crystal awards include a lined presentation box. There are three sizes available ranging from 9” x 4” x 4” to 12.25” x 5.5” x 5.5”. 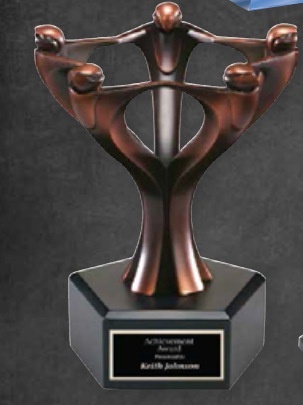 This metal statue trophy is a surprisingly affordable way to show your appreciation for a work group or team. It consists of five people holding hands to form a star when viewed from above. They are made of bronze finish resin and are mounted to a black hexagon base. These trophies come in one size: 8” x 4.75”. 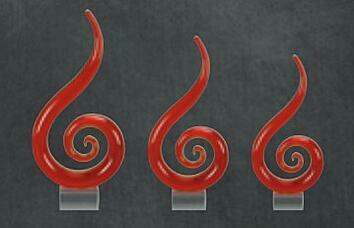 If you are looking for another glass art option, the Red Fire Glass Art Award is a smart choice. It consists of a red glass spiral that extends up, like a flame, and is mounted to a clear glass base. This comes in three sizes: 11” x 5.125”, 13” x 6”, and 15” x 7”. We would recommend this piece for a broad range of industries, including fire protection, food service, and design. When you are working with a budget, acrylic is your best option. The Resin & Acrylic Eagle is one of our fancier options. It consists of a clear engraved panel held in place by a partial eagle statuette. As with all of our trophies, we can custom engrave any messages, names, or logos you want on this trophy award. The Sign Studio is skilled at coming up with awards that are ideal for your situation. When you call us, we listen closely to your goals for the project. We then make recommendations based on your budget and vision. We provide you with art proofs of what the finished trophies will look like before we even begin. We will also deliver your awards to you in a timely manner. Contact our friendly professionals today for a free quote if you are interested in recognizing the achievements of athletes, workers, organizations, or anyone else with laser engraved trophy awards in Los Angeles.